When Dan LaCute awoke from a strange dream roughly five years ago, he could never have imagined the path it would eventually lead him down. Now Hospice Dufferin’s board chair, the retired educator remembers the exact moment he was encouraged to pursue volunteer opportunities in palliative care. Sitting down with the Citizen to talk about his participation in the upcoming 100km Healing Cycle bike ride, Mr. LaCute remembers where it all began. So Dan did the only logical thing – he signed up. In the years since, Mr. LaCute has spent time visiting clients in their homes, assisting with multiple fundraising efforts, serving on the board of directors and now, finally, acting as board chair. It’s been a whirlwind five years, but Dan wouldn’t have it any other way. Now, on the cusp of his second consecutive annual biking marathon, he’s keen to drum up as much interest as possible to help reach his fundraising goal. To date, Dan has raised $5,200, just $800 shy of his initial $6,000 target. The 17th annual Healing Cycle will take place in Brampton on Sept. 23. As the sole participant from Dufferin County, Mr. LaCute is ready to do the community proud during this year’s event. It won’t be easy, that much he was honest about, but he’s still looking forward to it all the same. In preparing for the mammoth ride, Dan has completed approximately 2,600km on his bike since the end of April. 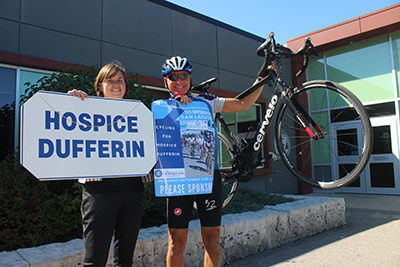 Maureen Riedler, Hospice Dufferin’s Executive Director, stated it was absolutely vital that the organization could call upon people like Dan to help fundraise year after year. The hospice is responsible for raising 70 percent of its annual budget, which runs at approximately $270,000, each year, with the Local Health Integration Network (LHIN) providing the rest. The Healing Cycle will act as a second fundraiser in as many weeks for the organization, following the success of its Bucket List Bash gala this past weekend. Taking place at the In Memoriam Life Celebration Centre in Mono, the event was a huge success according to Ms. Riedler. Acting as a joint fundraiser and celebration of the organization’s 30th anniversary, the Bucket List Bash was “a night to remember”, says Mr. LaCute. Now, he’s hoping to make next week’s Healing Cycle ride a day to remember. To donate to Dan’s cause, visit www.thehealingcycle.ca/donate and search ‘Dan LaCute’. Hospice Dufferin is working with Telecheck Dufferin and Alzheimer’s Society of Dufferin County to put on a Volunteer Fair for the Orangeville community. Six organizations have agreed to attend the first event next Tuesday, Sept. 18. It will be an opportunity to see a few of the options that are out there for volunteering in the community and learn about some of the services out there. “We are hoping to have a larger one in partnership with Volunteer Dufferin in the future as well,” the hospice said in a release Wednesday. The event will take place at the Alder Recreation Centre from 10 a.m. to 1 p.m. and 3 to 7 p.m.